EK RGB kits were created with three-fold purpose in mind. Provide the best performance in class and grant user the best possible modern aesthetic with RGB lighting, while maintaining silent operation. Make everyone in awe of your PC with either EK-KIT 240 or EK-KIT 360 depending on your cooling needs. Perfect for consumer grade CPUs and overclocking. Complete, fully RGB customizable liquid cooling kits that are ready for assembly! No need to worry about choosing parts or compatibility issues! Transform your air-cooled PC into a visual masterpiece! The end result is a high-end custom liquid cooling loop that is fully expandable and upgradable! Adding a GPU water block or other liquid cooling components to the loop is easy and possible at any point. These kits bring silence to your environment, and provide enough headroom for overclocking! The included pump and fans are all PWM controlled so that silent operation and efficient cooling can be dispatched on demand!! In comparison to air, liquid cooling is several times more effective in transporting heat away from a source to a radiator. Radiators have dense fins which combine to create a large cooling surface where a low-speed fan can effectively dissipate heat. You can enjoy gaming without any annoying noise coming out of your PC! Custom liquid cooling can outperform and outlive any AIO, not to mention standard air cooling solutions. Adequate cooling nullifies thermal throttling and allows you to take advantage of your hardware's additional performance. Overclocking raises the stock frequency which gives your hardware more computing power. 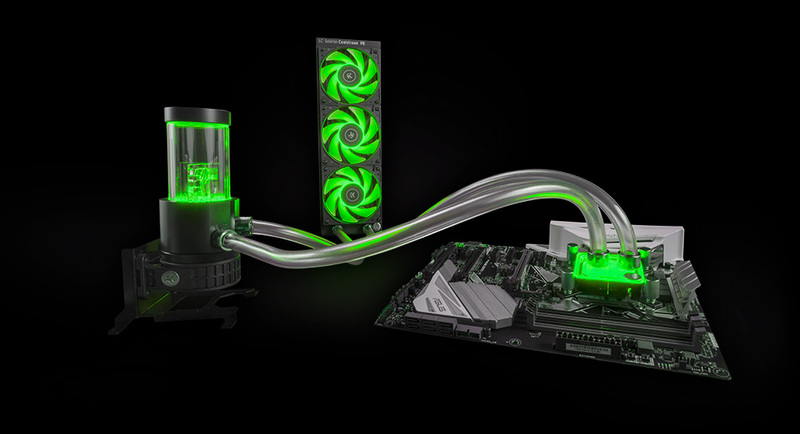 Liquid cooling is the only solution that can keep your overclocked hardware under control without the risk of overheating. Treat your PC with lower temperatures across the board while treating your eyes with awesome RGB cooling kit that will turn your PC into an art masterpiece. One of the key features of these kits is their simplicity, as all the included products use a standard 4-pin 12V RGB header for connectivity. Meaning, they can be used with any standard 4-pin 12V RGB controller or any of the popular RGB sync technologies from all major motherboard manufacturers. The included RGB splitter cables ensure that you will be able to connect all the products to a single RGB source header out of the box! 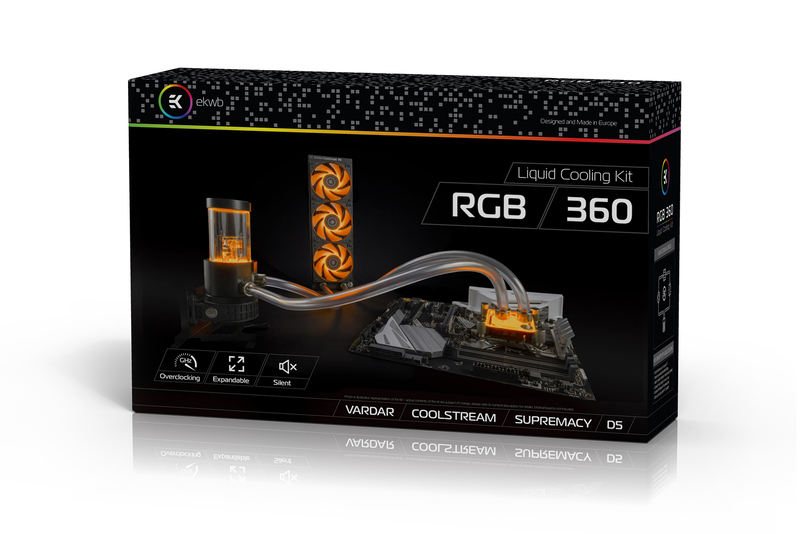 The EK-KIT RGB 240 and EK-KIT RGB 360 are the ultimate fully RGB customizable liquid cooling kit solutions which are dedicated to all users who seek the best price-performance ratio on the market! The kit contains everything you need to assemble your first high-end custom liquid cooling loop with carefully chosen components that will last you a long time! Just prepare your essential tools, follow the installation manual, and you will have your loop running in no time!